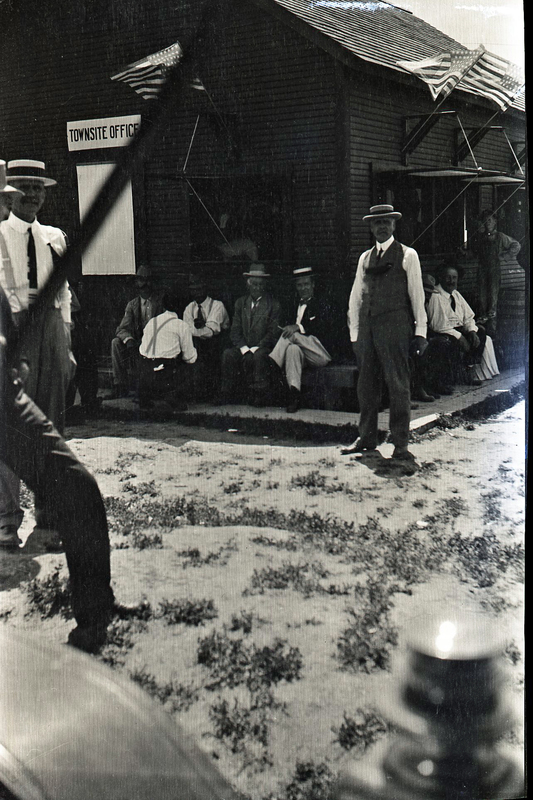 On a sunny, warm May morning, Dr. Alexander J. Chandler and his Chandler Improvement Company welcomed over 300 investors to the new town site that would bear his name. Special morning and midday trains from Phoenix brought potential buyers from Los Angeles, Mesa, Tempe, Phoenix, and points throughout the Southwest. According to a report, “At noontime the crowd enjoyed a bounteous luncheon of sandwiches, eggs, fruit, coffee, and lemonade spread by Dr. Chandler and his associates.” This feast was topped off with a special desert treat: fresh ice cream served in cones. On that single day, investors purchased more than $50,000 worth of lots surrounding the soon-to-be-built San Marcos Hotel, ensuring a bright future for Chandler and his city. Click HERE to see photos of Land Sales Day. For over 100 years, the community believed that this event took place on May 17, 1912. 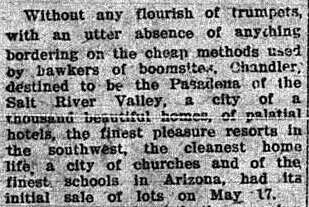 It was that day, according to a report in the Chandler Arizonan, that “Without any flourish of trumpets, with an utter absence of anything bordering on the cheap methods used by hawkers of boomsites, Chandler, destined to be the Pasadena of the Salt River Valley…..had its initial sale of lots on May 17.” Based on that one article, published nearly one week later on May 21, 1912, a birthday for the city of Chandler was established. Click HERE to read the Chandler Arizonan newspaper story about Land Sales Day. As any good newspaper report knows, you should always check your sources. This is especially important when the newspaper’s goal is promotion rather than journalistic integrity, as was the Chandler Arizonan’s. Chandler Museum staff, not satisfied with this sole description of the event, began looking at other local newspapers to discover additional descriptions of the event. A quick search on the Library of Congress website showed that the Arizona Republican, predecessor to the Arizona Republic, was digitized and available online. Click HERE to view the Arizona Republican on the Library of Congress website. Quickly, it was apparent through multiple ads splashed daily across the pages of the Republican, that the land sales event was held on Thursday, May 16, not on Friday, May 17, as previously believed. 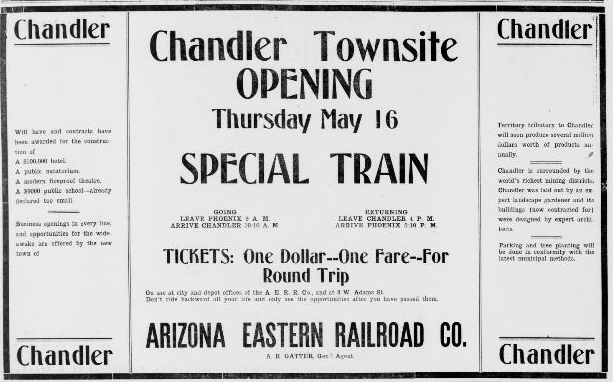 Discovery of an Arizona Republican article dated May 17 and stating that the event had taken place the day before confirmed that the town’s founding had been “mis-remembered” due to faulty typesetting in the Chandler Arizonan. And this early typo led to the event being memorialized on the wrong day for over 100 years. 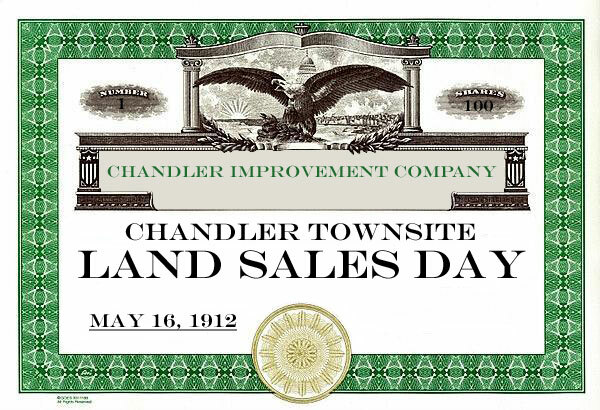 Click HERE to see all newspaper articles that Dr. Chandler and the Chandler Improvement Company placed in various newspapers throughout Arizona to raise awareness about the impending Land Sales Day for the Chandler Townsite. For those of us who work in history, we are always looking for new sources, better descriptions, and more accurate information about events of the past. Organizations like the Chandler Museum, which is digitizing the Chandler Arizonan, and the Arizona State Library, Archives, and Public Records, which is digitizing the Arizona Republican, are creating vast databases of historic information on the internet for all researchers to use. These information banks have, do, and will continue to correct historical fallacies, provide new discoveries about our history, and give us a better understanding of the world we live in today. History is a living endeavor, one that features constant re-visitation and revision based on better information and resources. Our understanding of the events of the past is constantly evolving. One hundred years after the fact, we discovered that the one fact that we thought we knew for certain was incorrect.